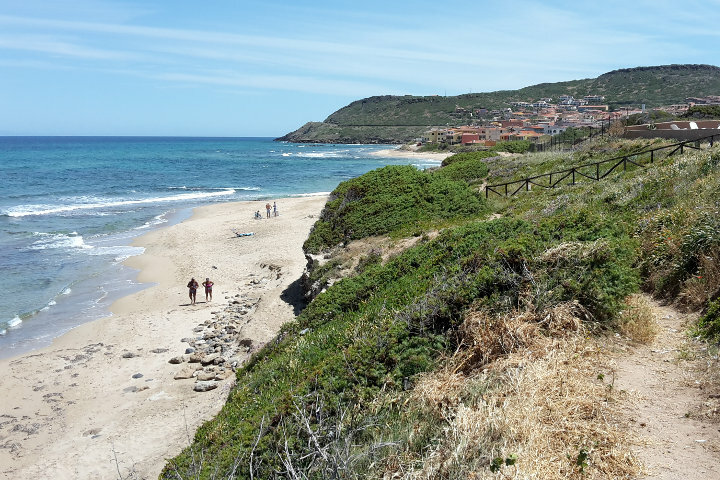 Summer is coming and we want to show our guide to the beaches of Castelsardo, famous sea destination in northern Sardinia! 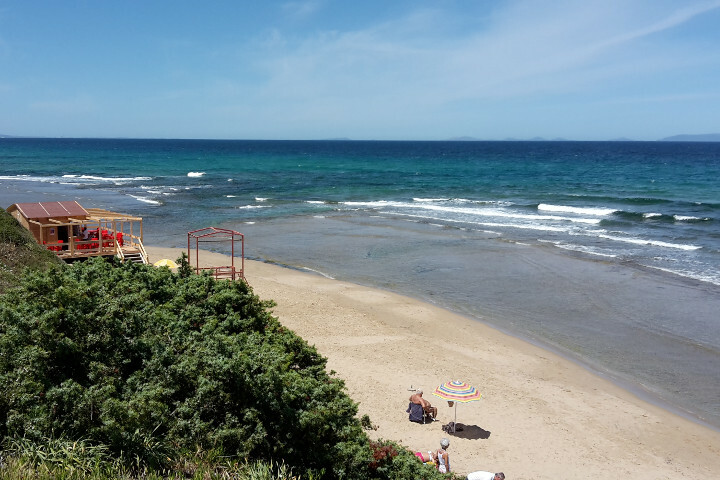 The town of Castelsardo is situated on a coast quite high and rocky; it has only a few small beaches, but you can find wider, popular and accessible beaches in the nearby village of Lu Bagnu. 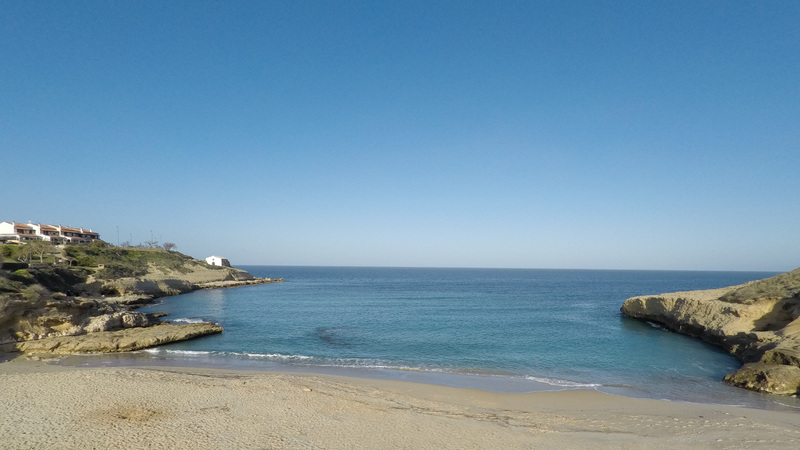 Because of these features, we will illustrate in detail the coast of Lu Bagnu, a place that in 2016 can boast two Blue Flags, as well as a Green Flag! 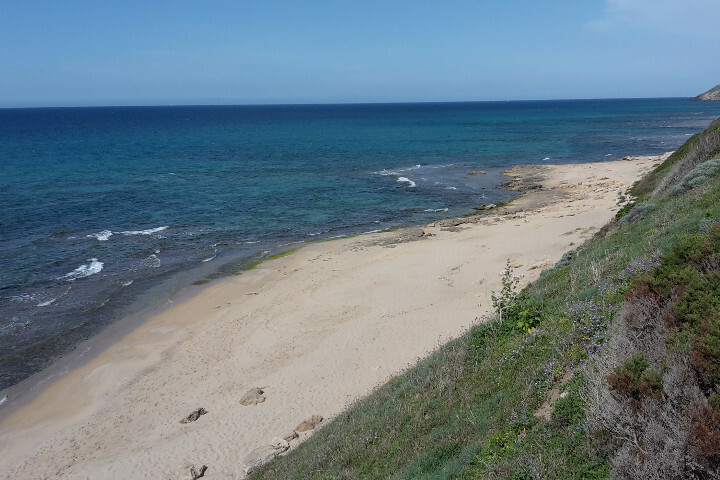 Depending on the landscape, the soil and seabed, we will describe the features of the beach related to various accesses to the sea (7 of them are reachable directly from Lu Bagnu). Click on the red markers to see detail about access to the beaches. 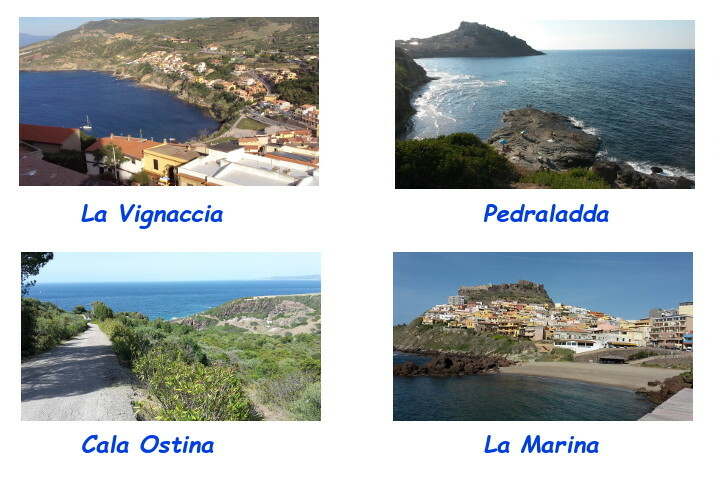 We will also provide a brief description of the remaining beaches in the surroundings of Castelsardo. 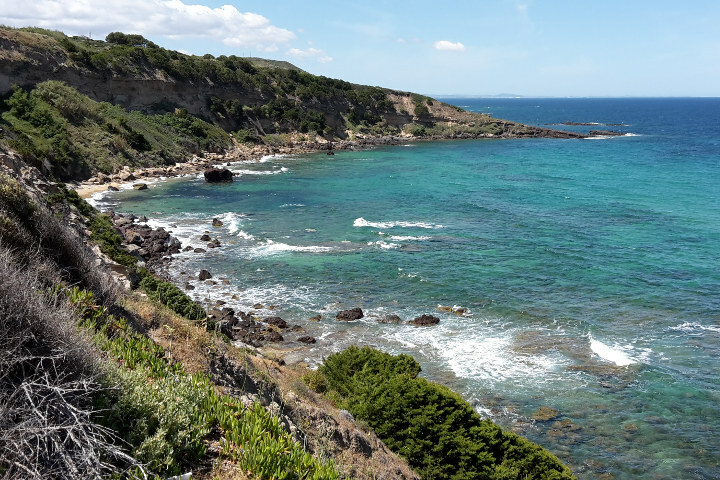 Starting from the east of Lu Bagnu, the first access to the sea is known locally as Sa Ferula, whose name derives from the nearby restaurant “Sa Ferula”; the “Ferula” is a typical shrub, widespread in the north of Sardinia. Here we can reach the sea along an impressive staircase, that allows you to enjoy a beautiful view of Lu Bagnu coast (near the panoramic green area, for walking and cycling). Below the stairs there is a rocky area and to the west begins the sandy beach which is joint with the whole of Ampurias. 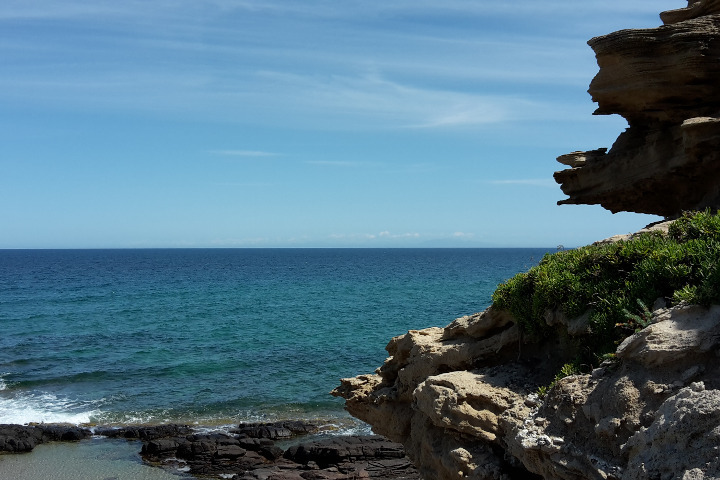 The zone near the cliff remains quieter also in summer, but the rocks in the sea make it less suitable for swimming. 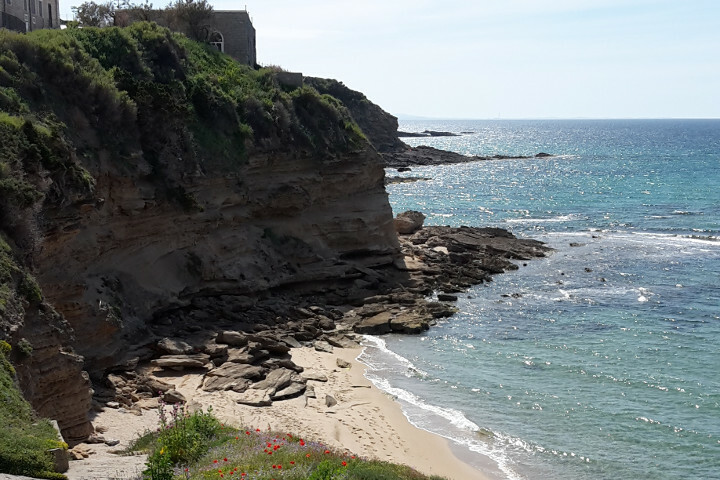 The beautiful sandy beach, that can be reached either by the descent of Sa Ferula or by this descent, known as Ampurias/Sacro Cuore. Here, too, the name derives from an homonymous accommodation (Ampurias) and a religious institute currently in disuse (Sacro Cuore). Ampurias was also the name of the ancient diocese of Castelsardo (in the town you can admire the ancient cathedral). 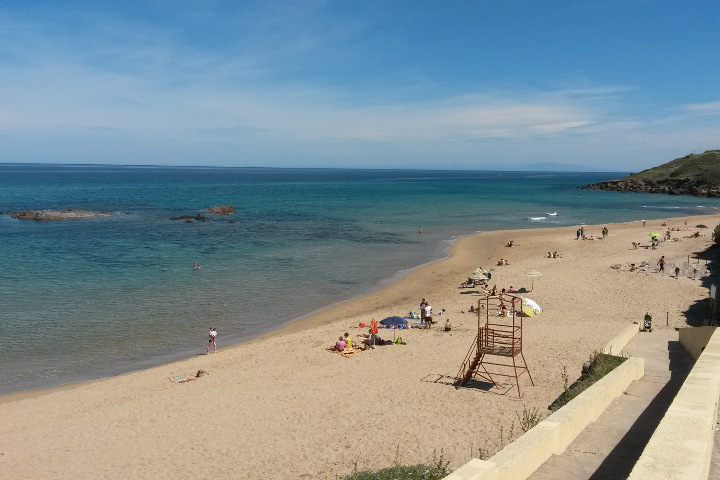 In the year 2016, the Blue Flag has been recognized to this section of the beach, characterized by shallow water and sandy, suitable for swimming and also accessible with children; the place is very attractive for the singular rocky island that rises a short distance from the water and the presence of various services: aid service, picnic area with a small kiosk, restaurants not so far and access ramp suitable for people with disabilities. 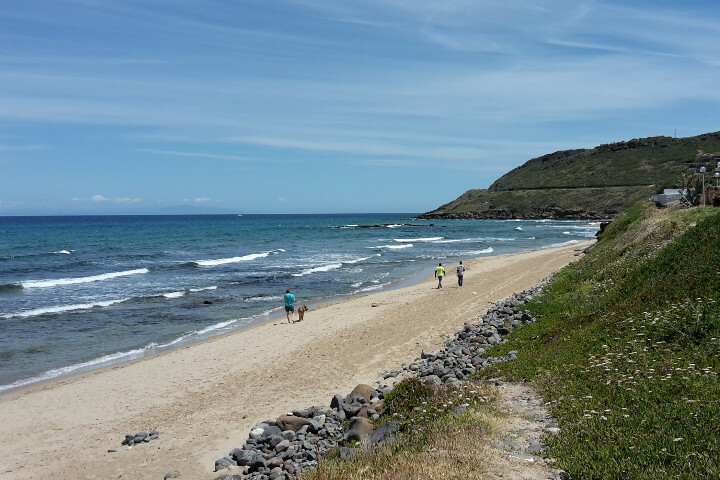 In summer it is definitely the most popular beach. The next part of coastline is accessible through the descent Vela Blu, so called because in the vicinity of the homonymous restaurant. It is similar in characteristics to the beach Ampurias, but having fewer services (no kiosk on the beach, or rescue service). The water is shallow and sandy, but continuing westward, it becomes more and more rocky. The name comes from a building that was once used as a summer residence for international religious (particularly from the US/America), which is still present, although dilapidated, and the fact that until a few years ago near the descent there was the old newsstands (edicola). The path to the beach starts through the bushes and reeds, at a short distance from the end of the Lu Bagnu river. The beach access is less convenient due to the lack of a stairway. 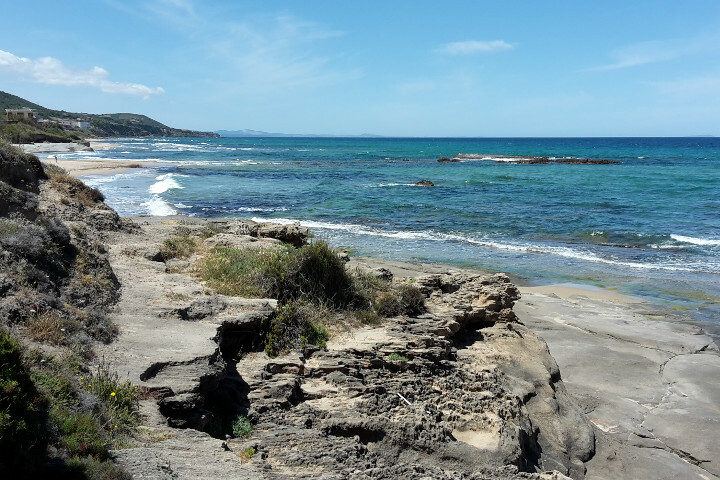 In this part, the sandy beach is narrower than at Ampurias, and in some places it is full of smooth pebbles (fluvial). In the sea there are sandy areas and flat rocks, which give pleasant shade of color to the water; the seabed is still shallow. The descent called the “Madonnina”, awarded with the Blue Flag 2016 title, starts from a parking marked by a statue of a Madonna, enclosed in a cave. From here you reach a beach with several services, including the kiosk, the possibility of aid and the ramp for wheelchair access. The features are similar to those already described for the Americani (sandy, shallow seabed, with areas of sand and rocks). 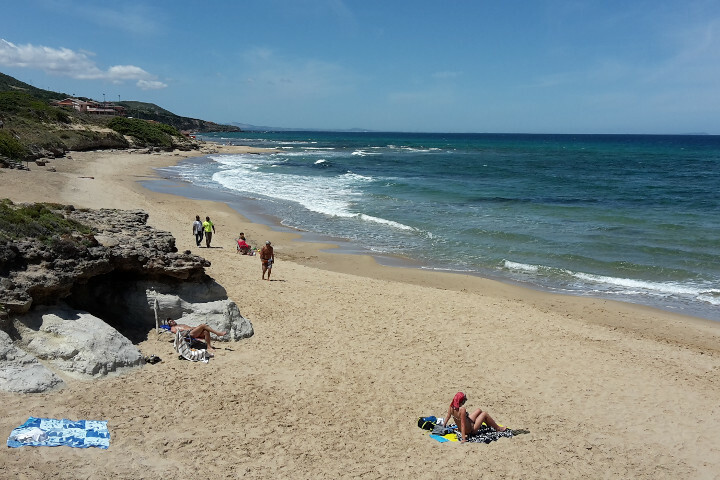 Like Ampurias, the beach is recommended for families and it is very busy during the summer. Through the descent of Celestine you access to the westernmost part of the coast of Lu Bagnu, at the end of the village. The name of the descent is linked to the building upon the cliff, a religious institute of the Celestine nuns. The beach is sandy with some scattered rocks, wilder than earlier, and it doesn’t offer services; anyway there is a large free parking. The medium depth seabed, partially rocky, involves greater caution for swimming; anyway here the hues and colors of the sea are very charming. 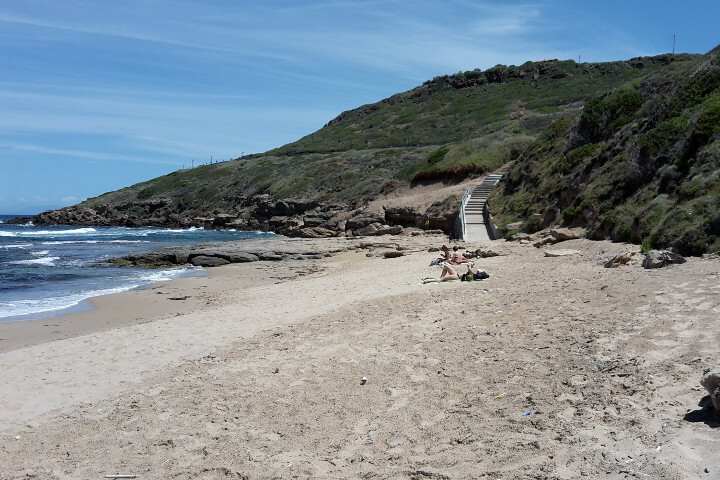 This place usually remains quieter and less crowded than other beaches of Castelsardo, even in the summer months. To the west you can walk under spectacular cliffs, with vertical walls eroded by the wind and dark rocks that plunge into the sea. The path up to the nearby Punta La Capra is very impressive! Near the exit sign of Lu Bagnu, it is located the last descent to the sea. It is a steep staircase that winds along the almost vertical cliff. From here there are superb views at eastward, overlooking Lu Bagnu coast; also on the opposite direction there are gorgeous panoramas, on a bay surrounded by vertical rocky slopes. The reef deserves a visit, especially for the natural scenery (to make great pictures! ), which includes a small natural pool surrounded by the rock platforms. The access to the sea in this area is rather difficult for the amount of rocks and it is not recommended in the presence of currents and rough sea. The area has no services. 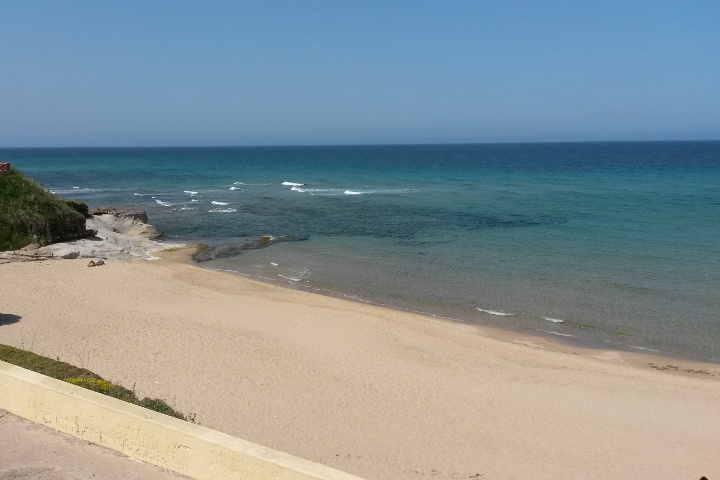 Continuing to west, after leaving Lu Bagnu along the coast road towards Sassari, we find the Punta Li Paddimi beach. 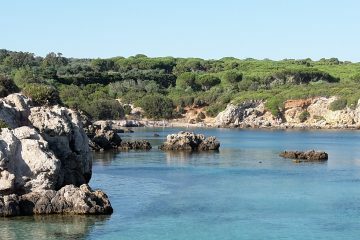 Enclosed in a small bay, however, it is accessible by road from the Rasciada Club resort and therefore intended only to its guests. 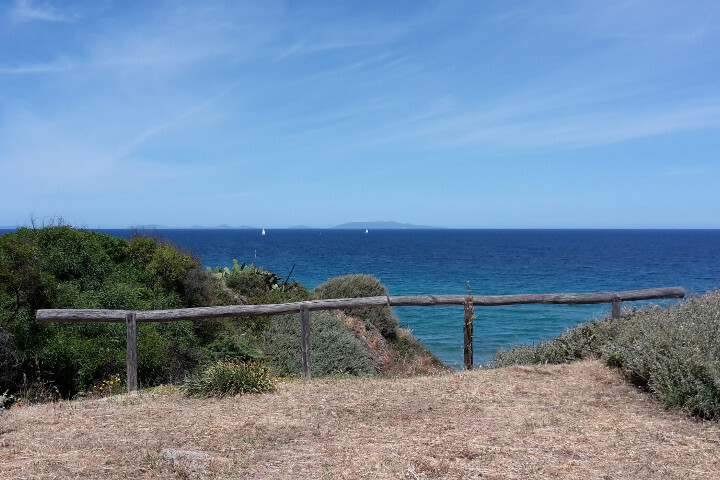 Further west of Punta Li Paddimi, near the junction with the road directed to Santa Teresa, you can go down through some meadows, Punta Tramontana. 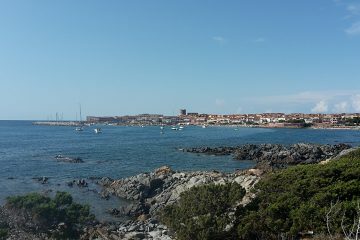 Here the coast is predominantly rocky, very popular among amateur fishermen. 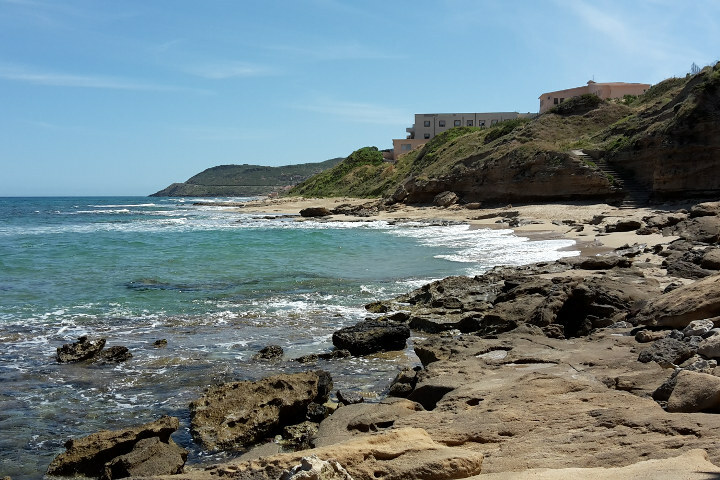 The little beach of La Marina is located in a small bay in Castelsardo and is the “beach of the town”. Easy to reach because of its central location, it is good choice to take a sunbath. From the eastern part of Castelsardo you can descend along the coast known as “la Vignaccia”; here you will find cliffs and small beaches. The modest amount of (dark) sand, the presence of deep water and rocks make this area less inviting for swimmers. Anyway from this cliffs you can observe the characteristic view of the fortress and the village of Castelsardo. It is interesting the presence of a unique flat rock, locally known as Pedraladda. 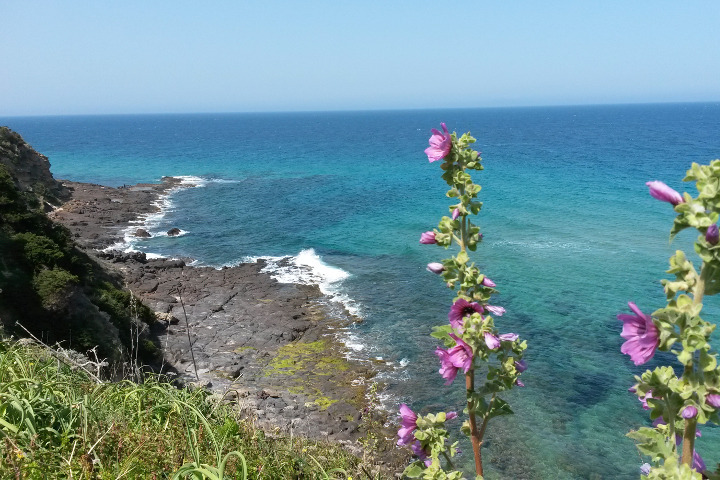 Continuing towards east from Castelsardo, you reach Cala Ostina; this name comes from an ancient port of the Roman era. Unfortunately, only guests of the homonymous resort can access to the beautiful beach, in the bay.